Strategies to save money... Where to start? To identify strategies to save money, you need to work on the major areas of your spending. Good news, it is low hanging fruit. Perhaps you have not thought about certain ways that you can save. Your major areas of spending are your home, your car, your shopping and insurance. Will give you specific tips in each area on how to save money, none are much more than common sense, and methods that we employee personally... and have for 40 years. 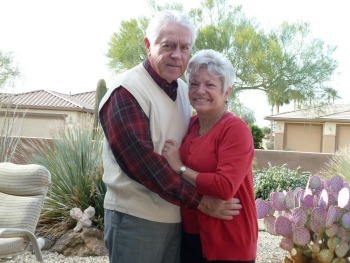 This is us outside our home in Arizona...your home is always a good place to start. If you are looking for ways to save money downsizing to a smaller home is a great way to start. Walk around your home and check the areas that you seldom use... these would be areas like formal dining room, formal living room, guest bedrooms. Then go back and look at what she use on a daily basis... invariably they will be the bedroom, bathroom and shower, kitchen, and usually a favorite chair to watch TV or read... that's not much space is it? We first discovered how little you need when we moved from a home to a 35 foot sailboat. If that is too extreme how about living in an RV? If you still have to have a house... a condo or townhouse arrangement is always cheaper, and less to take care of. You can downsize if you just think about it. The last house saving tip is to examine refinancing your home...we have done it four times in the last three years. This last tip is probably the the best and easiest, of the strategies to save money if you're going to stay in your existing home. Excluding your home usually your auto is the second-biggest expense. Here are some car tips...the short version is keep one as long as possible... we drive a 1999 Lexus with 280,000 miles on it currently. Find a mechanic that you can trust, because the longer you own the car the more things are going to break. Case in point, the check engine light recently went on our car, and the shop said $1200 will take care of it. I researched online, bought most of the parts on Amazon or eBay, and had a competent mechanic who works out of his home do the repair. Total expenditure $350. The time I spent to save $850 was minimal. Of course it helps to have a frugal wife. The best advice, is to use an independent broker who can expose you to the cheapest products. If you walk into an Allstate office, do you think he's going to tell you about Geico? Or Aetna? Fortunately for health insurance, there is a way to evaluate policies without giving out your phone number and deciding for yourself what's policy is best for your family. Here is what we have used for 12 years.